Rupaul’s Drag Race All Stars is an American reality competition show for drag performers. In simple terms, the format is this: a group of contestants each episode compete in different challenges related to drag, each week one gets voted of the show and when there’s only one left, that contestant is crowned the winner. A feature of the All Stars game that is different from an ordinary season of Rupaul’s Drag Race is that instead of the judge (Rupaul) deciding who’s sent home, the winners of the episode challenges decide which of the two worst-performing contestants that gets eliminated. This introduces a strategic element into the competition, and this is what will be analysed in this text. If you are the winner of the episode challenge, should you eliminate the strongest competitor or is there an advantage to gain from acting fair and eliminate the weakest one? Is it strategic to form alliances? Why is it, that in the show, the contestants tend to establish a norm of always sending home the weakest of the bottom contestants? These are some of the questions questions I will answer by using the tools of game theory. The rules of Rupaul’s Drag Race All Stars edition introduces an element of strategy that doesn’t exist in the ordinary version of Rupaul’s Drag Race. The strategy relevant decision is about which of the bottom contestants to send home when being an episode-challenge winner. I construct a simple game theory-model of the allstars-game, and show what predictions it makes about how contestants will act. The element of randomness is key to why there’s a strategic element in the game. If talent would determine winning and losing perfectly in the episode challenges, there would be nothing to gain from acting strategically. As we will see, the basic allstars model I construct fails in predicting player behaviour, and I propose a number of modifications to explain why the real game turns out the way it does. In the real game, we see a more or less explicit agreement being established to refrain from acting according to the way the model predicts (i.e. that winners eliminate the strongest competitors in order to better their own odds of winning), and instead always eliminate the weakest of the bottom contestants. The conventional view of why such a pact come to be, and the reasoning given for this agreement is that they wish to “play fair.” The model however shows that noble motives are not at all needed to explain this behaviour. Agreements about strategy that benefit the most talented at the expense of weaker contestants are likely to arise, at least initially. This is because these contestants both have an incentive to advocate such an agreement and a way to enforce it through the threat of eliminating defecters. Even though the standard allstars-model’s main prediction about behaviour don’t fit with the real outcome, with some modifications, we see that it can be used to explain a lot of behavioural patterns observable in the real competition. If we want to save as many human lives as possible in the traffic, we should start replacing our vehicle fleet to self-driving cars as soon as they are as safe as the average driver. Bureaucrats and politicians don’t have the information nor the incentive to get this right, instead they will want to avoid headlines by restricting self-driving cars, which means people who could have been saved will die. When should we allow self-driving cars on our roads? The intuitive answer is something along the lines of “when they are safe enough”. The question then become what we mean with “safe enough”. That depend on the goal. If our goal is to minimize the number of car crashes caused by self driving cars, then the answer is simple. Never. This is of course not an optimal policy, because if we care about saving human lives and minimizing damages, then it doesn’t matter if it’s the error of a machine or a human at fault. If we care about road safety in general, then we must accept the fact that people will be killed by self-driving cars. If a self-driving car is e tenth as dangerous as a human driver, then for any death caused by a self-driving car, there are on net nine people who are saved from dying on the road. Because the human driver who would have killed them wasn’t steering the car they were in. If all lives are valued equally, then we would want that self driving car to be out on the road, killing that one person. The safety of self-driving cars improve with time as technology advance, and as soon as self-driving cars as good as human drivers, we should start to replace our vehicle fleet. And when I say better than human drivers, I mean the average driver on the road, not the best human drivers. If self-driving cars are more likely to replace bad drivers than good drivers, then they should be allowed sooner. And if allowing self-driving cars can speed up the innovation in traffic safety then they should be allowed even sooner. For many people, this is not intuitive. Unfortunately, there is a difference between what should happen and what actually will happen. There is as a matter of fact reason to suspect that the people who have power to influence the decision of when to allow self-driving cars will fail to get it right. I don’t doubt that the bureaucrats and politicians who make regulation on self-driving cars have good intentions, and wish to see fewer people killed on the road. But all deaths are not treated equally. An accident caused by a self-driving car will get a lot of media attention. When a pedestrian was killed by an autonomous car in Arizona in march 2018, it became known across the globe. The people who are saved by self-driving cars however will not show up in any statistic and will motivate no headlines. It’s well established in psychology research that media coverage influence our perception about the frequency of events more than statistics. The nobel laureate Daniel Kahneman referred to this as the availability heuristic. Politicians who want to be reelected, and the bureaucrats under them who wish to keep their jobs, tend to want to avoid being blamed for deaths in headlines. On the issue of deciding when self-driving cars are “safe enough”. It’s easy enough to see what direction they might err. Even if these people understand the logic I’ve written of here, they have incentive to treat accidents caused by self-driving cars as much worse than accidents caused by human drivers. As a consequence, self-driving cars will come to the market way too late. This is not a new problem at all. The government authority in charge of regulating pharmaceuticals in the USA frequently get critique for being too strict with approving new drugs to become available to the public. It’s the same story as with the self-driving cars. Any death caused by an unsafe drug gets headlines. All the people who die because the drug that could save them isn’t available due to bureaucracy don’t get headlines. So they don’t count. The people who have the ability to assess when self-driving cars are safe enough are the people working on developing them, and if they care about their brand, they will not make that decision lightly. They would have the good incentives to make sure their self-driving vehicles actually are “safe enough”. Instead, they now have to prioritize meeting the regulatory standards set up by the bureaucrats. If we care about traffic safety, we should allow self-driving cars on the streets right now. A while back I read the widely known book by nobel laureate Daniel Kahneman “Thinking fast and slow”. In it he describe a psychological heuristic called peak-end rule. It describes the observation that people’s perception about an activity depend heavily on how they experience its end rather than say the sum of or the average moment of the experience. The participant’s remembered the second trial more favourably even though they experienced unpleasing temperatures for a longer period. This finding have very practical applications in many areas such as business, health care and even dating. The ending of a customer interaction will be highly influential for whether or not the customer will come back to your business in the future. By making the ending of a painful medical treatment slightly less painful, patients will have a better experience, and perhaps have an easier recovery. If you want to maximise your chances of getting that second date, don’t argue over whether or not you should split the bill after the restaurant visit on the first date. Applied to game economics, this means player’s opinion of a video game will be highly influenced by the ending of the gaming sessions, rather than the overall playing experience. Now what makes someone stop playing a certain game? The economists way of thinking about this is to think about decision making at the margin. Suppose we are talking about a game that isn’t continuous but consists of subgames such as battlefield, or dota where players play matches. After each match, the player will make an inner calculation whether to play another game or not. As long the marginal benefit is higher than the marginal cost, they will continue playing. This means there’s a great chance that the last match that they play each session is the one that gives least satisfaction (if there’s decreasing marginal utility from playing video games). Considering the peak-end rule, this is not at all optimal. If a gaming session is disrupted by an exogenous factor (for example because the player’s parent demands they go to bed because it’s weekday and they have school tomorrow), the player might get a more positive view of the game than if the player is (a grown up and) allowed to play however much they want and so play until they grow tired or bored. If game developers deliberately create game session disrupting elements in the game, it’s possible that total amount played will increase. In other words, even though each session is cut down before the player themselves chooses to stop playing, increased number of gaming sessions may lead to a larger total playing time – and a better playing experience. Creating session disruption elements in a game might be a sensitive thing to do however, and different individuals may respond differently to such mechanisms. In freemium games, only allowing players to play for a limited time (for free) can be one way of doing this. Including natural waiting periodsis another way (in Simcity BuildIt, players have to follow specified time schedules to harvest/farm/cash in on resources and so continue playing). This is a hypothesis still. But a testable one! As I’ve written before, video games are the perfect environment for social science randomized controlled trial experiments. Here’s one thing that would be cool to test. Black Friday handlar om prisdiskriminering, inte främst om att boosta försäljning, i motsats till gängse uppfattning. Det är en shoppinghögtid som gynnar de fattiga på bekostnad av de rika då det är ett sätt för företag att ta olika pris av olika konsumentgrupper. De fattiga är de som gynnas, tack vare att de rika är mindre priskänsliga och därför inte tar sig upp dagen efter thanksgiving för att leta efter billiga fynd. Anti-konsumptionsrörelsen som uppmanar till bojkott av Black Friday skadar inte företagen, tvärt om. Genom att få de opriskänsliga konsumenter att inte ta del av de låga priserna får de Black Friday att fungera än mer effektivt som mekanism för prisdiskriminering. Black Friday is about price discrimination, not primarily boosting sales contrary to popular perception. The shopping holiday benefit the poor at the expense of the rich as it is a way for firms to charge different prices for different groups of customers. The poor are the ones who benefit from the low prices, thanks to the rich not being as price sensitive to get up the day after thanksgiving to scavenge for bargains. The anti-consumption movement that boycott black friday doesn’t hurt black friday. No, rather the opposite. By motivating the not-so-price sensitive to boycott the event, it makes black friday even more effective as a mechanism for price discrimination. Read the full text here! I morgondagens SvD skriver Jacob Lundberg och jag om våra slutsatser från den forskningsöversikt som vi skrev i under sommaren då jag jobbade som forskningsassistent på Ratio forskningsinstitut. Debattartikeln kan också läsas på nätet från och med ikväll (länk). Forskningsöversikten publicerades idag som ett working paper för Ratio (länk). Vi skrev också en rapport på svenska där vi tittar närmare på fallet Sverige, de svenska studier som finns på ämnet och uppskattar effekten av det svenska jobbskatteavdraget som infördes under alliansregeringen. Även den publiceras idag, hos den marknadsliberala tankesmedjan Timbro där Jacob är chefsekonom (länk). This summer I worked as a research assistant at ratio research institute and together with Dr. Jacob Lundberg conducted a research overview/meta study that is published as a working paper today (link). We also wrote a report focusing on the case of Sweden for the free market think tank Timbro, which is also published today in swedish (link). 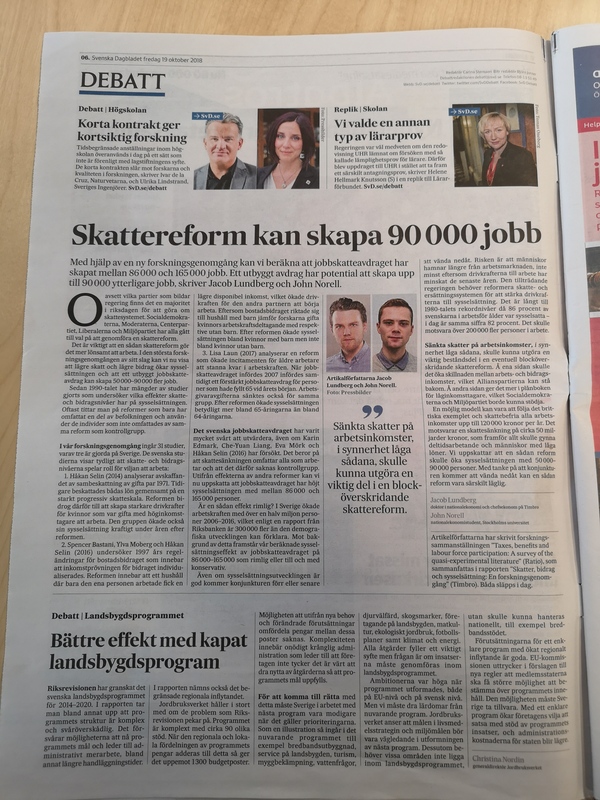 In addition, we are writing about the findings in a debate article in tomorrows edition of SvD, on of the biggest daily newspapers in sweden. The text can be found online at this link. I’m super excited to finally share the work with everyone, pleasant reading! Under våren skrev jag min kandidatuppsats i nationalekonomi vid handelshögskolan vid Göteborgs Universitet. I och med detta blev jag klar med min ekonomie kandidat. Den som är intresserad av att läsa uppsatsen så finns den tillgänglig gratis på nätet (länk). Titeln på detta inlägg avslöjar frågeställningen för uppsatsen, och jag tänkte lite kort skriva om uppsatsen i detta inlägg för den som är nyfiken men inte orkar med att läsa igenom hela uppsatsen (den är skriven på engelska). Sedan några årtionden tillbaka har intresset för vad som leder till lycka/välmående i samhället ökat bland ekonomer. 1974 publicerades en särskilt inflytelserik artikel som presenterade statistik som visade att trots att människor i rika länder är lyckligare än människor i fattiga länder, så verkar det inte som att ekonomisk tillväxt leder till en motsvarande ökning i välmående i samhället. Denna iaktagelse – kallad the easterlin paradox efter forskaren Richard Easterlin – har sedan dess flitigt diskuterats inom forskningen. Eftersom mått på ekonomisk tillväxt såsom BNP ofta används som en proxy för välmåendet i samhället så är det absolut en frågeställning värd att forska kring. (en genomgång av forskning om välmående relaterad till inkomst, ekonomisk tillväxt, samt ojämlikhet finns från sida 6 i uppsatsen). I vår studie använder vi data från European Social Survey (ESS), som sedan 2002 utfört intervjuer i europeiska länder där intervjuobjekten bland många andra frågor ombetts uppskatta sin upplevda ”life satisfaction” samt ”happiness” på en skala mellan 0 till 10. Totalt har vi svar från nästan 400 000 människor från 36 olika länder, mellan åren 2002 och 2016. Det är ett enormt datamaterial vi har kunnat använda, som vi sedan använt en ekonometrisk metod kallad fixed effekt regression (mer om metoden finns i uppsatsen) för att undersöka kopplingen mellan ekonomisk tillväxt och samhälleligt välmående. Huvudresultatet kan kort sammanfattas med att det finns ett tydligt positivt (och statistiskt signifikant) samband mellan ekonomisk tillväxt och välbefinnande. Med andra ord tyder vår undersökning på att den kritik mot att ekonomisk tillväxt bör vara ett mål med politiken med argumentet att det inte leder till högre lycka i samhället inte har grund i statistiken. I uppsatsen diskuterar vi resultaten i mer detalj och presenterar även data på effekten av ojämlikhet på lycka. För att ladda ner uppsatsen gratis eller läsa online, gå in på länken här. Trevlig läsning! This spring, I did my last semester for my Bachelor of science in economic sciences at Gothenburg University. That meant writing my bachelor thesis, which is published online for free for anyone to read (link). The titel of the thesis is ”Is it wrong to assume economic growth promotes well-being in society?” and it’s written in english. Spoiler warning, we found strong empirical evidence that economic growth indeed is correlated with increases in subjective well-being. More information about our essay can be read in the abstract. Or why not download the essay and have a look! A while back, I wrote a text explaining why trade wars isn’t a game of winning or loosing but rather, that both sides of such a conflict are more or less losers. It’s published in swedish on the web magasine Smedjan owned by the think tank Timbro, linked here. One of the key examples I touch on comes from the book the armchair economist by Steven E Landsburg: on how cars can be grown in the fields of Iowa, english link here. It’s a simple methaphor, but a brilliant way to illustrate who wins and looses on trade, why it deserves to be read by many more. As I couldn’t find a swedish version I wrote one myself. I’m in the middle of writing my bachelor thesis in economics right now and so far it’s been a roller coaster and we’ve had to change subject multiple times now, which is a bit stressful to say the least. Since I’ve spent a lot of time reading research and thinking about what could be potentially interesting research questions, I figured I’d share a little bit of what I’ve learnt and perhaps someone in the future will benefit from it. To see all footnotes and reference, the text can be read in pfd format here. The first idea I had of what would be an interesting subject to delve into was suspense and surprise in e-sport. I came across a theoretical article published in 2015 where the authors develop a microeconomic model for quantifying suspense and surprise. (I first heard about it from an episode of the podcast freakonomics). The starting point for the suspense and surprise model is thinking about why it is that people watch sports, read mystery novels, follow political elections and a range of other activities that wouldn’t really make sense if it was the acquiring information that was the purpose. A more reasonable explanation would be that people get joy from the way the information is delivered in these situations. Basically, their theory is that people gain utility from being held in suspense or the feeling of being surprised. Researcher have in experiments shown that suspense do increase the entertainment value of sports. To try and explain it simply, suspense is what you experience when you anticipate that soon something big will happen that will change your beliefs. A situation with high suspense could for example be that you think that the outcome of the serve is likely to determine the outcome of a tennis match, or that the who gets the votes from a particular wing state is likely to determine the winner of a political election. In the model, they express this mathematically: suspense is then measured by the variance of your beliefs in the next time period. Surprise is then measuring how much your beliefs changed from the previous time period to this one. If something happens that totally changed your beliefs about will win an election, who’s the murderer in the mystery novel or win the football match, then you will be feeling a lot of surprise. These two concepts are related to each other, suspense is about what you expect to happen, surprise is about what then actually happens. Both suspense and surprise is about how information is delivered to you, not the actual information. The problem with this theory is that it’s a bit tricky to test. This is because we need data on people’s subjective beliefs about the likelihood of specific events and how these change with time when more information is revealed. One way to deal with this is to use live betting odds (which measure the aggregated beliefs of the bettors about the likelihood of an event happening) as an approximation for people’s subjective beliefs. This approach was used by (Bizzozero et al, 2016) to apply the suspense and surprise model to tennis matches at Wimbledon. Betting odds is enough to create estimations on the level of surprise the audience experience at any given point during a sport match (or any event as long as there are live betting markets operating). If you have data on concurrent viewership (how many people watch the game at any given point of the match), it’s not very difficult to test if there is a relation between surprise and viewership. the idea being that people are less likely to stop viewing the match (turn off the tv) when something surprising is happening or has happened. Suspense is a bit more difficult to quantify, since you not only need people’s actual beliefs about the likelihood of player X winning the match at every point of the game (for this we can use the live betting odds again), we also need to know people’s beliefs in hypothetical cases. What would their beliefs have been if player Y would have won this serve instead of what actually happened, that player X won it. And we need this for every scenario at every point of the game. This is what is meant by the variance of beliefs in the next time period. If there are only two outcomes of a tennis serve, then suspense is measure by the distance between beliefs based on what happened and what you would have believed in the counterfactual case. The research article I mentioned above where the authors look at suspense and surprise at Wimbledon, they create a simulation model to create predictions about the likelihood of each player winning based on data of what happened in the game as well as historical data about each players previous performances. The predictions by the simulation model was very similar to what the live betting odds predicted, and by tweaking this model they were able to make predictions about the counterfactual situation in every point of the game and hence estimate the level of suspense at every point in the game. To be honest, that is a very clever way to do it, I was impressed reading their method section. For more complex games, where the game can’t be easily divided into subgames and turns but instead play out continuously, it’s much more difficult to create simulation models and estimate suspense. In video games such as dota, CS:GO or Fortnite, the number of possible actions at every point in the game is almost endless so quantifying suspense in such a game would be quite a daunting task. Though I actually found a research plan from a group of researchers who planned to do this to see if the level of suspense in a match in the video game League of Legends can be used to predict the likelihood of players continuing to play the game or not. Unfortunately I could not find if they actually went through with the plan or not. As is evident from the statistics on viewership on video game streaming sites such as Twitch and youtube gaming, entertainment habits are changing rapidly, especially among young people. The audience of people playing video games is growing fast and this creates interesting questions about what it is that makes a video game popular with the audience. Video game developers are no longer only in the industry of providing entertainment for the players, but also entertainment for a growing streaming audience. If the streaming viewers and the gamers have different preferences then that pose an interesting question for game developers how to weigh there interests. Even if the game developer don’t make much money on the viewers directly, it’s still a form of marketing for them. If the audience have a preference for suspense, then we can expect the strategies used by popular streamers to be different from the average players because they have a crowd to entertain. If we can identify how these strategies differ, then that can tell us something about the audience. Two of the most popular games right now on twitch are PUBG (short for Player Unknown Battlegrounds) and Fortnite. These games are both what are called battle royal games which are similar to the tournament in the hunger games series for the one who’ve read the popular books or seen the movies. A hundred people are dropped on an island to scavenge for weapons, armour and other useful equipment. A player wins the game by being the only survivor left on the island. It’s possible to win this game by staying hidden and wait for all the other players to kill of each other. Such a player strategy isn’t very suspenseful to watch for the audience of a video game streamer however. A players who throughout the game continuously risk being killed by engaging with enemy players will produce a more suspenseful game for the audience. I suspect therefore streamers are more likely to apply more aggressive and/or riskier strategies compared to non-streaming player. Can this be measured? I think so, if more aggressive tactics also mean they will encounter more enemies, then they are both more likely to be killed and to kill more players than other players that are as skilled as them. I have not however found that kind of statistic, but maybe someone will be able to find or gather that in the future. Due to the complexity of the method and our problems of finding data we changed course, to instead look at the role of luck in E-sport tournaments. As I’ve described above, surprise and suspense are concepts related to the way information is revealed. In order for there to be suspense in a match, there need to be a level of uncertainty about the outcome. So then the question becomes, where does this uncertainty stem from? When you are watching a football match, this uncertainty I believe can come from two sources. First from you not knowing which is the better team. If a game of fotball always resulted in the victory of the more skillful team, then any suspense or surprise must come from uncertainty about which is the better team. The other possible source of uncertainty comes from the fact that the game doesn’t perfectly measure the relative skill level of the players. Sometimes the better team loses a game, so there is a component of randomness in outcomes. This component we can call “luck”. Based on this idea, a game/sport/activity where luck have no part whatsoever, and where the skill of participants/players/teams doesn’t change much from game to game, would be very predictable. And even though there might be other reasons for observing this game, it wouldn’t be very suspenseful. In the book “the success equation”, Michael mauboussin explain that while success in some activities are determined solely by chance (such as the lottery) and some solely by skill (playing a musical instrument for example), for most things in life both skill and luck have part in the outcome. There is a lot of literature on the role of skill vs luck in different activities, mostly these researchers have studied games such as poker and chess. These papers often relate to the discussion of weather or not a game shall be classified and therefore also regulated as games of skill or of games of luck. Skill here is understood as to what extent the individual or player can influence the outcome of the activity or the game. One conclusion to draw from these studies is that while roulette and chess are easily classified, most games are not. Instead of asking whether of not a game is a game of skill or of luck, a better question if when the game becomes a game of skill. If a player can gain even the slightest advantage by skill, then it will become a game of pure skill when playing an infinite number of games. So even the game of Rock-Paper-Scissors becomes a game of skill if you play enough matches. In games where players compete against other players, skill is no longer an absolute characteristic but a relative one. What I mean by that is that how much of an advantage you get from your abilities depend on the abilities of your competitor. In professional sport leagues where all players are very skilled, the variance of skill is low. This causes luck to be more important to succeed. This is quite counter intuitive, that as everyone gets more skilled in the game, luck will have a greater influence on the outcome. So while many game becomes more of a game of skill when you play more matches, it becomes more of a game of luck when everyone gets more skilled. Since we know how randomness behaves, we can measure to what degree skill and luck respectively determine success for different activities. In the book mauboussin does this for the five biggest sport leagues in America (baseball, basketball, soccer, ice hockey and american football). Can this method be applied to E-sport tournaments? How much influence does randomness have on the outcome of these tournaments basically. The video game industry change so rapidly (some of the most popular games that are streamed at twitch, PUBG and Fortnite, hadn’t even been released a year ago) and both the audience and the players seem to be less loyal to one specific game or brand if you compare to traditional sports. For this reason, perhaps e-sport tournaments cluster together around the optimal level of luck-level on this luck-skill-continuum. this optimal level would then constitute the optimal level according to the audience. That is of course only a thought, perhaps e-sports are just as scattered as other sports. If this optimal level of luck involved in the outcome is related to the audience preference for suspense and surprise, or some completely different mechanism, I don’t know. Just to test out the idea I tried it out on the ESL CS:GO 5on5 Open League Spring 2017 Europe . 422 team of five players joined the group tournament and each team played up to 7 matches, from which top advanced to an elimination tournament. Below you can see a histogram of all teams that played 5 matches and how many wins each team won. If the relative skill level of the competing team of each match would perfectly determine who won the match, then we would expect a flat distribution. While if each match was determined solely by randomness, say a coin flip, then we would expect a binomial distribution. what we see below is something in between, which suggest there is both skill and luck involved here. Next I calculated the variance of luck and subtracted that from the total observed variance to estimate the variance of skill. When the number of matches a team play increase, the role of skill increase, but it’s around 50% for teams playing 5-6 matches each. The problem though is that I’ve not been able to find any good peer-reviewed sources for this method. For this reason, we had to change approach again, this time looking into happiness research, by suggested from our supervisor. I can’t say I’m super excited, but it’s only a bachelor thesis, so I’ll manage. Economics is the study of decision making by individuals, using mathematical models and empirical methods. One of the big problems of economics (and of all social sciences) is that we cannot conduct randomized experiments the same way as in natural sciences. Imagine a political science researcher proposing that for the next term in office in the municipality, a set of randomly chosen municipalities will be used to experiment with various not-so-democratic regime types. It’s easy to see why that wouldn’t be feasible. Instead, social science researchers have developed a range of advanced statistical tools to mimic the same mechanisms in order to find causal relationships. Video game platforms, however, present a virtual environment where suddenly, it can be possible to conduct these social experiment. There are games where, hundreds of thousands of players interact with each other. And the data available (I presume) is far better than what we can collect about how people interact in the real world. Some of the games that exist not only allow the players to engage in trade with simple homogeneous goods with others, they contain advanced economies that mimic a range of elements of real economies. I’m really excited about the entry of social science researchers into the realm of gaming. Hopefully I will be able to be a part of it. Enabling trade in games might sound easy, but there’s no one version of the market. For markets to function efficiently and smoothly, game developers need to think long and hard about what consequences to expect for different market design issues. My guess is that there will be a lot more game economists employed in game development in the future. Some while ago, I wrote a post about how to design a market in Pokemon GO, I will probably write more on economics in video games in the future.